German criminal procedure law places great emphasis upon judgements made pursuant to the “substantive truth.” Therefore, exclusion of evidence tends to be an anomaly as it compels the trial court to disregard certain evidence, which implies that the court must base its judgement on something less than the whole truth. German law does provide for the exclusion of evidence in some situations, but its effect is limited to preventing the trial court from explicitly relying on the inadmissible evidence as a basis for the judgement. That said, in most cases the judges nevertheless remain aware of the excluded evidence. Under German law there is absolute protection of conversations between individuals in intimate relationships as a result of the protection of core privacy. If such conversations are captured and stored during surveillance they cannot be used unless related to past or future crimes. If evidence is obtained by violating this law, the approach of most German courts is to weigh the individual privacy interests against the interests of the justice system in having access to all available information. If the violation was intentional, however, the evidence is typically excluded. Section 136a of the German Code of Criminal Procedure provides that statements obtained through the use of prohibited means of interrogation, such as force, threats, and illicit promises, cannot be used as evidence. Exclusion of evidence creates a dilemma. On the one hand, there exists a great systemic interest in basing the judgement in criminal cases on true and complete facts; a finding of guilt or innocence should not be made on the basis of inaccurate factual assumptions.1 This fundamental interest in determining the relevant facts leads to an intensive search for the truth, first by the agents of criminal law enforcement, then by the trial court. The goal, in all legal systems, is to assemble all relevant evidence and to enable the factfinders to base their judgement on information that is as complete as possible. On the other hand, there are instances in which the use of individual pieces of evidence in court appears to be unfair or even counterproductive. A piece of evidence may in fact impede the goal of truth-finding, e.g., when a document has been forged or a confession has been brought about by torture. More frequently, the goal of finding the truth competes with other interests, most importantly the interest in conducting fair proceedings. The ideal of a fair trial requires that the agents of the state comply with all rules designed to protect the suspect’s procedural rights, such as his right to remain silent and his right to be free from arbitrary searches and seizures. If the suspect’s rights have not been respected, it appears unfair to employ, for proving his guilt, an item that the agents of the state should not have obtained at all, or should not have obtained under the particular circumstances. In that situation, there exists a conflict between the goal of a fair trial and the judicial system’s interest in collecting and using all relevant information for the sake of finding the truth. The German response to such conflicts is determined, to a large extent, by the German legal system’s traditional reliance on the inquisitorial system, which places on the trial court the responsibility for collecting and evaluating the evidence as well as for finding the facts relevant to the judgement. According to § 244 sec. 2 German Code of Criminal Procedure (CCP), the trial court, in particular the presiding judge, is responsible for deciding what evidence will be presented at the trial. The prosecution as well as the defense may propose additional pieces of evidence, but the court decides on the relevance and admissibility of the proposed evidence (§ 244 secs. 3–6 CCP). The court is in any event free to introduce evidence that neither party has proposed. The German procedural system places great emphasis on the determination of the “substantive truth” as a basis for a just and fair outcome of any criminal case.2 The criminal process is conceived as a sequence of two independent efforts to find the truth; first by the prosecutor and the police, then by the trial court. As soon as the suspicion of a criminal offense becomes known to him, the prosecutor is obliged to investigate the matter (§ 160 sec. 1 CCP). The police are likewise mandated with investigating criminal offenses and with taking all measures necessary to avoid the loss of evidence (§ 163 sec. 1 CCP). When an indictment has been filed, it is the trial judge who must collect all evidence necessary for establishing the facts relevant for the determination of guilt or innocence (§ 244 sec. 2 CCP). In order to prevent the court’s truth-finding process from being predetermined by the prosecutor’s investigation, the court may base its judgement only on what has been said and done at the public trial (§ 261 CCP, so-called principle of immediacy); moreover, live witness testimony must not be replaced by the introduction of protocols of prior interrogations of the witness or by similar documents at the trial (§ 250 CCP). Although the Code of Criminal Procedure does not explicitly mention the “search for truth” as a goal of the process, it contains several provisions which confer obligations on prosecutors and judges to collect relevant evidence (see 2 above). Importantly, the Federal Constitutional Court has declared that the criminal process has the purpose of making certain that no punishment is imposed without a determination of the defendant’s guilt, and that it is therefore necessary for the trial court to determine the true facts before it may convict a person.3 According to this decision, the principle of truth-finding is an element of German constitutional law, ultimately linked to the protection of the dignity of the person (Art. 1 Basic Law). The Code of Criminal Procedure does not explicitly state that a conviction requires proof of the defendant’s guilt beyond reasonable doubt. Instead, § 261 CCP provides that the court renders the judgement in accordance with its free conviction, based on the evidence presented at the trial. This legal rule is in line with the inquisitorial principle, according to which no “party” in the criminal process bears a burden of proof. But there can be no doubt that the court’s conviction must be based on a rational evaluation of the available evidence, and that the defendant must not be convicted if the judge entertains a reasonable doubt of his guilt.4 § 244 sec. 2 and § 261 CCP presuppose that the trial court has pursued all reasonable avenues of inquiry before it renders the judgement. As mentioned above, the trial court must, according to the inquisitorial principle, take the initiative in investigating the relevant facts and must hear all relevant evidence. On the other hand, the principle that the judgement is to be based on the “free” conviction of the court (§ 261 CCP) implies that there exist no formal rules that would oblige the court to hear a certain type or amount of evidence. For example, the court may rely on the testimony of a single witness if that testimony is convincing and is not put into serious doubt by a plausible statement of the defendant. German law does not have a corroboration rule; hence a single witness’s testimony can be sufficient for convicting the defendant. The “free conviction” principle also applies to statements of the defendant: if the defendant makes a statement in open court,5 explaining in detail how he committed the offense, the court may determine that this statement is sufficient for finding the defendant guilty, and may dispense with calling witnesses or hearing other evidence. The fact that the court is free to base its judgement on a single piece of evidence has led to the practice of “confession bargaining”, which the legislature in 2009 has introduced into the Code of Criminal Procedure (§ 257c CCP). According to that practice, the trial judges and the defense can negotiate a lenient sentence in exchange for the defendant making a confession in open court to the crime charged. Although the law provides that the court still retains the obligation to diligently search for the truth,6 trial courts often accept the defendant’s confession as a sufficient basis for finding him guilty and for sentencing him to a penalty previously agreed upon. The Code of Criminal Procedure also contains specific rights commonly associated with the general right to a fair trial. For example, according to § 136 sec. 1 CCP anyone questioned as a suspect has the right to remain silent and to be informed of that right before the start of an interrogation; he also has the right to consult with a lawyer and to have the lawyer present during the interrogation (§§ 163a sec. 4, 168c sec. 1 CCP). § 148 CCP guarantees suspects the right of unsupervised contacts with a defense lawyer even if they are held in pretrial detention. The Constitution (Basic Law) provides for several individual (basic) rights which can have an impact on the criminal process. For example, Art. 104 Basic Law guarantees the freedom of movement, which may be restricted only by decision of a judge. As a consequence, a person may be held by the police without a judicial warrant only until the end of the day following arrest, and pretrial detention requires a judicial order (Art. 104 sec. 2 and 3 Basic Law, §§ 112, 128 CCP). The criminal process can roughly be divided into four stages. At the investigation stage, the prosecutor’s office, with the assistance of the police, seeks to determine whether an initial suspicion of criminal wrongdoing is well-founded, and collects evidence as a basis for the decision whether to bring charges against one or more individuals (§ 160 secs. 1 and 2 CCP). When the prosecution has filed a formal accusation (Anklage) with the trial court, the case enters into the second stage, the so-called intermediary procedure (Zwischenverfahren). These proceedings are normally conducted in writing, but the court may hold a hearing (§ 202a CCP) and take evidence (§ 202 CCP).21 The trial court then determines, on the basis of the prosecutor’s findings and possibly of its own (limited) investigation, whether there exists sufficient evidence for holding a public trial of the person(s) named in the accusation (see §§ 199–211 CCP). The court also examines the legal correctness of the charges raised in the indictment and may change the legal appreciation of the facts charged (§§ 206, 207 sec. 2 CCP). If the trial court finds that there is sufficient suspicion that the defendant has committed a crime, it holds a public trial in the presence of the defendant (§§ 226–275 CCP). At the end of the trial and after deliberations of the judges, the presiding judge announces the court’s judgement. If the defendant has been convicted, the judge also pronounces the sentence. When the judgement has been rendered, the case may enter into the appeals stage. In Germany, both the defendant and the prosecutor can appeal a judgement that goes against their interests. The appeal against the judgement of a local court (Amtsgericht) can lead to a new trial (Berufung; §§ 312–331 CCP); if the trial was held in district court, the losing party may file an appeal on the law (Revision). This appeal is successful if the trial court misapplied the relevant substantive law and/or committed a procedural fault that could have had an impact on the outcome of the case (conviction or sentence) (§§ 337, 338 CCP). At the pretrial stage, the responsibility for fact-finding is divided between the prosecutor’s office and the police. The prosecutor is charged with investigating the matter once an initial suspicion has arisen (§ 160 CCP). The prosecutor has the authority to undertake investigatory measures of any kind (§ 161 sec. 1 CCP), in particular to summon and interrogate witnesses and experts (§ 161a CCP). However, with respect to certain investigatory acts that infringe upon basic individual rights (e.g., searches and seizures), authorization by a judge is required. The police have a dual function in the pretrial investigation: on the one hand, they are obliged to carry out investigatory acts upon request of the prosecutor (§ 161 sec. 1, 3rd sent. CCP); on the other hand, they are authorized to investigate criminal offenses and to take all measures immediately necessary to avoid the loss of evidence (§ 163 sec. 1 CCP). According to the law, the police are obliged to transmit their findings to the prosecutor “without delay” (§ 163 sec. 2, 1st sent. CCP). But in practice this requirement is not observed strictly: police often complete the investigation of routine matters on their own and send the file to the prosecutor’s office only when they deem the case cleared. In sum, fact-finding at the trial is a collective effort dominated by the presiding judge. The interests of the persons involved do not always concur, however. Whereas the court and the prosecutor seek to establish the truth, the defendant may have a strong interest in hiding the truth. The German procedural system tolerates that countervailing interest to the extent that the defendant is not penalized for telling lies in court. But the defendant must not forge documents or induce witnesses to give false testimony. The pretrial investigation is conducted unilaterally by the prosecutor and the police. The investigation can be conducted in secret, without the knowledge of the suspect; there is no formal announcement to the suspect that he has become the object of a criminal investigation. The prosecutor is obliged to provide the suspect with the opportunity to present his side of the case only before the conclusion of the investigation (§ 163a sec. 1 CCP); The investigation should not be partisan, however. According to § 160 sec. 2 CCP, the public prosecutor shall investigate not only circumstances incriminating the suspect but also those possibly exonerating him. At least in the early phase of a criminal investigation, the prosecutor and the police are likely to abide by this rule, because they have no interest in filing an accusation that will not hold up at trial. Irrespective of the inquisitorial structure of the pretrial process, the defense has (limited) participation rights. For example, the suspect may request the prosecutor to take exonerating evidence; yet, the prosecutor must honour that request only if he thinks that the evidence suggested by the suspect is of relevance (§ 163a sec. 2 CCP).24 The defense lawyer has a right to attend (and to ask questions at) any interrogation of the suspect by a judge, a prosecutor, or the police (§§ 168c sec. 1, 163a sec. 3, 4 CCP). If a judge interrogates a witness,25 both the suspect and the defense lawyer have a right to be present and ask questions (§ 168c sec. 2 CCP). The suspect and the defense lawyer are free to conduct their own investigation and to collect evidence to be offered at the trial; however, they cannot oblige any witness or other person to make a statement or otherwise cooperate with them. If the defense lawyer wishes, for example, that premises be searched he must file a request with the prosecutor, who in turn would have to seek a judicial search warrant if he agrees with the defense lawyer’s request. Although the prosecutorial investigation is not public, the defense lawyer has a general right to inspect the prosecutor’s file. According to § 147 CCP, defense counsel may request to inspect the prosecution file at any time; the prosecutor may, however, withhold disclosure of certain sensitive parts of the file until the investigation has been concluded.26 There is no reciprocal duty on the part of the defense to grant the prosecutor access to the results of their own investigation. There is no general information available on the satisfaction of the German public with the functioning of the criminal justice system, especially with respect to the relationship between truth-determination and the protection of individual rights. Print media reporting on criminal trials frequently mention the fact that the defendant has chosen to remain silent, but they normally do so without negative comment. Although the pretrial investigation is not public, media reporting before trial is not prohibited.29 Ethical rules for the press discourage the media from disclosing the full name of a suspect or defendant unless he is a publicly known person, and media also should not portray a person as “guilty” before the court has rendered the verdict. But such limitations apart, the media are free to report on crime and on the criminal process, and they often do so. Reporters receive their information mainly from press releases or press conferences of the prosecutor’s office and possibly of the defense lawyer. The question whether a suspect in a spectacular case has made a confession to the police or prosecutor will normally be communicated to the media and will promptly be reported. Trials of adults are open to the public and the media, except that the public can be excluded for certain parts of the trial in order to protect the privacy of witnesses, victims or defendants (§§ 171b, 172 Gerichtsverfassungsgesetz (Court Organisation Act)). Sound and video recordings as well as live reporting from criminal trials are prohibited (§ 169 2nd sent. Gerichtsverfassungsgesetz). Miscarriages of justice are relatively rarely discussed in Germany. The Code of Criminal Procedure provides for a special procedure to re-try terminated cases if new evidence is presented that casts doubt on the correctness of the judgement (Wiederaufnahme, §§ 359-373a CCP). Such re-trials are not frequent. There have been a number of spectacular cases in which persons convicted of murder were later found to be innocent,30 but these cases have not indicated systemic problems concerning the process of truth-finding. At the trial, only four types of evidence are available for the proof of a person’s guilt: witness testimony, expert testimony, documents, and real evidence. The trial court is free to choose among available items of evidence, except that the testimony of a witness must not be replaced by using as documentary evidence the protocol of his interrogation before trial (§ 250 2nd sent. CCP). The general guideline for the taking of evidence at the trial is the court’s responsibility for determining the truth: according to § 244 sec. 2 CCP, the court shall extend the taking of evidence to all facts and items of evidence that are necessary for the court’s decision. This rule shows the inquisitorial heritage of German law, and it has been in the Code of Criminal Procedure since its adoption in 1877. The first legal provision explicitly demanding the exclusion of illegally obtained evidence (§ 136a sec. 3 CCP; see below at 3.2) was introduced in 1950. Its adoption was a reaction to the abuses, including torture, prevalent in interrogations during the National-Socialist era. The exclusion of evidence obtained through physical force, threats and other forbidden methods was introduced not so much because of the unreliability of statements resulting from such methods but in order to protect the dignity of the persons interrogated and the general principle of a state based on the rule of law (Rechtsstaat).34 Other explicit exclusionary rules were introduced after 2000 in order to protect core privacy rights in connection with the surveillance of conversations and telecommunications (§ 100e CCP) as well as the confidential relationship between a suspect and his lawyer (§ 160a sec. 1, 2nd sent. CCP). These rules provide for the mandatory exclusion of “core private” evidence obtained, although the measure (wiretap, surveillance of live conversations) as such was perfectly legal. There is no statutory rule demanding the exclusion of evidence derived from inadmissible statements or communications. A prohibition of using a piece of evidence does not normally mean that the members of the trial court (which consists of a single professional judge or a mixed panel of professional and lay judges) do not become aware of the evidence in question. If the relevant evidence (for example, a statement of the suspect or of a witness) is included in the prosecutor’s case file, the professional judges see this item before trial because the prosecutor sends them his file along with the formal accusation.48 If evidence is introduced at trial and is subsequently determined to be inadmissible, even the lay judges will have seen or heard the statement in question. “Exclusion” thus means only that the court must not base its judgement on the evidence in question. Judges are, in other words, supposed by law to “forget about” inadmissible evidence when deliberating on the judgement and when giving their (oral and written) reasons for the verdict and sentence. It is an open question to what extent judges (and especially lay judges) are capable of performing that psychological acrobatics. There is presently no public debate on this issue. In many instances, the Code of Criminal Procedure provides that suspects, defendants and witnesses shall be informed about their rights. As has been mentioned before, this applies to the suspect’s right to remain silent and to obtain the assistance of a lawyer (§ 136 sec. 1, 2nd sent. CCP). Other examples are a suspect’s rights after he has been detained (§ 114b CCP) and a witness’s right not to incriminate himself (§ 55 sec. 2 CCP). Detained persons can also demand to be examined by a physician (§ 114b sec. 2 no. 5 CCP). Generally, these rights are protected by judicial surveillance, either by a right to appeal directly to a judge (as with detained suspects, § 119a CCP) or by basing a motion for reviewing the judgement (Revision) on the alleged procedural fault. These means are prohibited because they tend to overbear the individual’s will, but they are prohibited regardless of whether they actually have this effect in the individual case. The means listed must not be applied even with the consent of the interrogated person. There are no special rules in German criminal procedure with respect to weeding out before trial evidence that has been obtained by torture. In theory at least, the public prosecutor’s office conducts the pretrial proceedings (§§ 160 sec. 1, 161 sec. 1 CCP). If the police use torture and this becomes known to the prosecutor, he must refrain from using any statement obtained through torture for the further investigation (§ 136a Sec. 3 CCP; see below). In fact, however, prosecutors rarely participate actively in the investigation but leave it largely to the police. Prosecutors typically review the police file only when the police consider the investigation terminated, with the case ready for dismissal or for indictment. The prosecutor may then send the case back to the police, however, for further investigation if he thinks that not all relevant facts have been elucidated or that critical evidence would be inadmissible in court. When the prosecutor has filed a formal accusation, the trial court—sitting without lay judges—reviews the file of the investigation and decides whether there is sufficient evidence available to make the accused stand trial on the charges (§ 199 CCP; see above). At this stage of the proceedings, the trial court will also consider whether evidence proposed by the prosecution is admissible at trial. If critical evidence (e.g., a confession of the accused) is inadmissible, the court may decide that the remaining evidence will probably not be sufficient for conviction, and may on that ground refuse to open trial proceedings. Although German law does not provide for a hearing on the admissibility of evidence, such issues can be discussed either during the intermediary phase or at a special hearing held by the court before trial (§ 212 CCP). As has been noted above, the trial court is solely responsible for deciding what evidence is to be presented at trial (§ 244 sec. 2 CCP). If evidence (e.g., a witness statement) has been presented at the trial, according to the Federal Court of Justice it will be presumed that the defense consents to its use unless the defendant’s lawyer72 explicitly objects as soon as the evidence has been introduced.73 This means that defense counsel must immediately raise any doubts he may have as to the admissibility of any evidence. There are no special procedures available for bringing cases of torture to the attention of courts. Anyone may file a criminal complaint (for assault—§ 223 Penal Code—or for coercing testimony—§ 343 Penal Code) or a civil suit for damages (§§ 823, 839 Civil Code) against the offending officer. The issue may also be raised in the context of the criminal proceedings against the tortured person as an objection to the use of evidence under § 136a sec. 3 CCP. § 136a CCP does not distinguish between cases of torture and of other undue physical or mental coercion. What has been said above about the procedural consequences of torture therefore applies as well to other (lesser) forms of physical abuse or mental torment. Procedural safeguards for the protection of the right to remain silent are similar to those protecting against torture: suspects have a general right to consult with a lawyer before they submit to questioning by the police or other law enforcement personnel. Suspects must explicitly be informed of the right to consult with a lawyer prior to any interrogation, and they must be assisted in obtaining access to a lawyer (§ 136 sec. 1, 2nd and 3rd sent. CCP).104 The defense lawyer has the right to be present during any interrogation of a suspect and can advise his client of the proper use of his right to remain silent (§§ 168c sec. 1, 163a sec. 3, 2nd sent., sec. 4 3rd sent. CCP). As with violations of § 136a CCP, the principle in dubio pro reo is said not to apply to the question whether the suspect’s right to silence had been observed at all times. If the trial court is not convinced that a violation occurred, it will admit the evidence in question. As for the evidentiary consequences of undue coercion, see supra on § 136a CCP. Statistical evidence on the application of exclusionary rules is not available. In summary, one can say that Germany still pursues the ideal of finding the truth in the criminal process and places great emphasis on this goal. Although the protection of human rights is seen as part of the constitutional principle of Rechtsstaatlichkeit, and although human dignity has been accorded the highest rank in the German constitutional hierarchy, the exclusion of evidence is regarded as an anomaly. There are only few instances of mandatory exclusion. Some of them concern the protection of core privacy (§§ 100a sec. 4 and 100c sec. 5 CCP), and some are to safeguard the integrity of interrogations (especially § 136a sec. 3 CCP, but also judge-made rules such as the exclusion of a suspect’s statements if information on the right to remain silent and the right to a lawyer had not been provided115). In most other instances of the violation of individual rights, German courts engage in a balancing process, excluding relevant evidence only if there is no overriding interest in using the evidence for determining the truth. 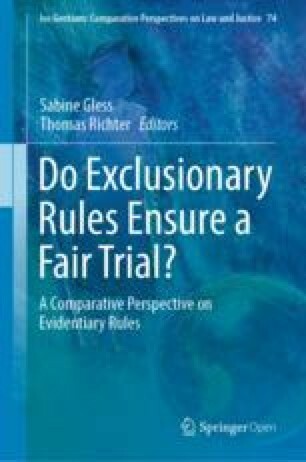 Moreover, exclusion of evidence generally covers only evidence that has been directly obtained through a violation of procedural rules; derivative evidence is generally accepted, with few exceptions. Institutional mechanisms for ensuring respect for human rights in the context of the criminal process are limited. The most important tools are the obligation of interrogators to inform suspects and witnesses of their respective rights, and a suspect’s right to have the assistance of a lawyer.116 Yet, it should be noted that not every suspect can receive the services of a lawyer free of charge (cf. § 140 CCP). With regard to the balance between truth-finding and protection of human rights, the trend in Germany is toward cautiously extending the scope of exclusionary rules, especially in cases where a state agent intentionally or arbitrarily violated a procedural rule protecting the rights of the suspect. This trend has been initiated and fuelled by the jurisprudence of the ECtHR and the German Federal Constitutional Court, sometimes against the persistent opposition of the criminal courts. It is an open question whether exclusion of tainted evidence is actually effective in discouraging rule violations. It is difficult to find out to what extent and in what areas police and prosecutors may tend to disregard the restrictions on collecting evidence that procedural law provides. From the published case law, it appears that searches and examinations of the body are more susceptible to rule violations than interrogations; but there may exist a dark figure of unknown size in either area. Given the remoteness of police activities in investigating crime from actual trials, and the relative scarcity of trials (in relation to written procedures and consensual dispositions), it is unlikely that exclusion of evidence has a strong educative or deterrent effect on individual police officers who may have committed a procedural fault in the early stages of an investigation. On the other hand, the inquisitorial tradition is still strong in Germany, and that tradition is inimical to any effort of purposely manipulating the factual basis of the court’s judgement. Alternative ways of curbing disregard of individual procedural rights by police and prosecutors are limited to the usual mechanisms of imposing individual responsibility through disciplinary and (depending on the factual situation) criminal law. There is a functioning disciplinary system of police forces in place, but it seems that it is more geared toward combating police violence and corruption than toward suppressing the use of illicit investigatory measures. Academic writers as well as the defense bar tend to support increased reliance on the exclusion of evidence and a general strengthening of tools for guaranteeing respect for human rights. But the influence of both groups on law reform is very limited. At this time, the emphasis of official “reform” measures is on increasing the speed, economy, and “efficiency” of the criminal process.117 Exclusion of evidence does not seem to be a welcome instrument for achieving these goals. See Stuckenberg, 2016 at 695 et seq., with further references. See Kühne, 2010 at 195–6; Roxin/Schünemann, 2014 at 85–87. BVerfG, Judgement of 19 March 2013 – 2 BvR 2628/10, 2 BvR 2883/10, 2 BvR 2155/11 (=Entscheidungen des Bundesverfassungsgerichts (BVerfGE) 133, 168, 199). See Sander in Löwe/Rosenberg, 2007 at § 261 notes 103 et seq., with further references. According to § 243 sec. 5 deutsche Strafprozessordnung (StPO), officially translated as German Code of Criminal Procedure (CCP) of 7 April 1987 (Status as of 17 August 2017), available online at <https://www.gesetze-im-internet.de/stpo/BJNR006290950.html>, accessed 1 November 2018, at the beginning of the trial the defendant is invited to respond to the accusation. The defendant, of course, retains the right to remain silent. § 257c sec. 1, 2nd sent. in connection with § 244 sec. 2 CCP. Bundesgesetzblatt II 1952 at 685. BVerfG, Decision of 14 October 2004 - 2 BvR 1481/04 (=BVerfGE 111, 307). BVerfG, Decision of 3 June 1969 - 1 BvL 7/68 (=BVerfGE 26, 66, 71); Decision of 8 October 1974 - 2 BvR 747/73 (=38, 105, 111); Decision of 26 May 1981 - 2 BvR 215/81 (=57, 250, 274). Rzepka, 2000; Beulke, 2016 at 33–34. BGH, Decision of 27 February 1992 - 5 StR 190/91(=BGHSt 38, 214, 220); Judgement of 18 November 1999 - 1 StR 221/99 (=45, 321, 335); Judgement of 25 July 2000 - 1 StR 169/00 (=46, 93, 100). For a brief discussion, see Weigend, 2014; for an extensive treatment, see Stuckenberg, 1998. See Meyer-Goßner/Schmitt, 2016 at § 100c note 2. See BGH, Judgement of 29 April 2010 - 5 StR 18/10 (=BGHSt 55, 121, 135); Judgement of 20 June 2012 - 5 StR 536/11 (=NJW 2012, 2453); see also ECtHR, Jalloh v. Germany, case no. 54810/00, Judgement of 11 July 2006. See, e.g., BVerfG, Judgement of 16 January 1957 - 1 BvR 253 56 (=BVerfGE 6, 32, 41); Decision of 8 March 1972 - 2 BvR 28/71 (=32, 373, 378–79); Decision of 31 January 1973 - 2 BvR 454/71 (=34, 238, 245); Decision of 26 April 1994 - 1 BvR 1689/88 (=90, 255, 260 et seq. ); Judgement of 3 March 2004 - 1 BvR 2378/98 u. 1 BvR 1084/99 (=109, 279, 313); Judgement of 27 July 2005 - 1 BvR 668/04 (=113, 348, 390–91). For an overview, see Roxin/Schünemann, 2014 at 184–85. See BVerfG Judgement of 3 March 2004 - 1 BvR 2378/98 u. 1 BvR 1084/99 (=BVerfGE 109, 279, 323–333). A similar exclusionary rule applies to communications between the suspect and his defense lawyer (§ 160a sec. 1 2nd sent. CCP). In this instance, it is not the right to privacy but the protection of the integrity of the defense that prompts the exclusion. BGH, Judgement of 10 August 2005 - 1 StR 140/05 (=BGHSt 50, 206); Judgement of 22 December 2011 - 2 StR 509/10 (=NStZ 2012, 277). BVerfG Decision of 14 September 1989 - 2 BvR 1062/87 (=BVerfGE 80, 367). BGH, Judgement of 28 June 1961 - 2 StR 154/61 (=BGHSt 16, 164); OLG Hamburg, Decision of 14 June 2005 - IV-1/04 (=NJW 2005, 2326). For criticism of this rule, see Gless in Löwe/Rosenberg 2007 at § 136a note 78. See below for a discussion with respect to allegations of torture. In practice, this option is very rarely used. For details, see § 244 sec. 3 – 6 CCP. The victim of an offense has the same right to move for taking additional evidence if the victim has joined the accusation as an auxiliary prosecutor (Nebenkläger) (§ 397 3rd sent. CCP). Meyer-Goßner/Schmitt, 2016 at § 241 note 6. The prosecutor’s decision not to take the requested evidence is not subject to judicial review; see Kölbel in Münchener Kommentar, 2016 at § 163a note 48. The prosecutor may request a judge to interrogate individual suspects and witnesses or conduct other acts of investigation in the course of pretrial proceedings (§ 162 CCP). The results of judicial interrogations can be introduced as evidence at the trial under less restrictive conditions than the protocols of police or prosecutorial interrogations (§§ 251, 254 CCP). For details, see § 147 sec. 2, 3 and 6 CCP. See, e.g., BGH, Decision of 29 August 1974 - 4 StR 171/74 (=BGHSt 25, 365, 368); Judgement of 26 October 1983 - 3 StR 251/83 (=32, 140, 144). For details, see Gless in Löwe/Rosenberg, 2007 at § 136 note 36. BGH, Decision of 27 February 1992 - 5 StR 190/91 (=BGHSt 38, 214, 220). For a brief discussion of media publicity (and many further references), see Roxin/Schünemann, 2014 at 109–11. See, e.g., Oberlandesgericht Frankfurt am Main, Decision of 4 December 1995 – 1 Ws 160/95, (1996) 16 Strafverteidiger, 138–41; Schwenn, 2010. See, e.g., § 100i CCP, introduced in 2002, regulating the determination of the identification number and location of a mobile phone. For example, the possibility of installing hidden microphones in private homes for surveillance purposes was severely restricted in 2005, following a ruling of the Federal Constitutional Court (BVerfG, Judgement of 3 March 2004 - 1 BvR 2378/98 u. 1 BvR 1084/99 (=BVerfGE 109, 279)) that the prior version of the law had neglected the necessary protection of core privacy. BVerfG, Decision of 9 November 2010 - 2 BvR 2101/09 (=NJW 2011, 2417, 2418-19). Gless in Löwe/Rosenberg, 2007 at § 136a note 1. BVerfG (1. Kammer des Zweiten Senats), Decision of 9 November 2010 - 2 BvR 2101/09 (=NJW 2011, 2417, 2418); BGH, Decision of 21 January 1958 - GSSt 4/57 (=BGHSt 11, 213, 214); Decision of 27 February 1992 - 5 StR 190/91 (=38, 214, 219); Kudlich in Münchener Kommentar, 2014 at Einleitung notes 454–55; Meyer-Goßner/Schmitt, 2016 at Einleitung note 55. See BGH, Decision of 27 February 1992 - 5 StR 190/91 (=BGHSt 38, 214, 219). For example, § 81a sec. 1, 2nd sent. CCP provides that certain intrusive examinations of a person’s body may only be performed by a licensed physician. The purpose of this rule is to protect the examinee’s health. It would therefore make little sense to exclude the result of an examination conducted by a nurse, since its relevance for the criminal process is in no way affected by the violation of the “licensed physician” rule. See BGH, Decision of 17 March 1971 - 3 StR 189/70 (=BGHSt 24, 125, 128). For an overview of relevant factors and various academic theories on the subject see Kudlich in Münchener Kommentar, 2014 at Einleitung notes 449–94. See Nix v. Williams, 467 US 431 (1984). See Beulke, 1991 at 666–71; Wohlers, 2013 at 1190–91; Rogall in Systematischer Kommentar, 2016 at § 136a notes 115–22, with further references in n. 763. For a similar argument, see BGH, Judgement of 24 August 1983 - 3 StR 136/83 (=BGHSt 32, 68, 71). BGH, Decision of 27 February 1992 - 5 StR 190/91 (=BGHSt 38, 214, 220); BVerfG, Decision of 16 March 2006 - 2 BvR 954/02 (=NJW 2006, 2684). This is the term used in § 136a sec. 3, 2nd sent. CCP and in § 100d sec. 2 CCP (concerning “core” private conversations). Kudlich in Münchener Kommentar, 2014 at Einleitung note 449. BGH, Judgement of 24 August 1983 - 3 StR 136/83 (=BGHSt 32, 68, 70). See, e.g., § 160a sec. 1, 2nd sent. CCP (concerning conversations between the suspect or defendant and his lawyer). Kölbel in Münchener Kommentar, 2016 at § 160a note 14. The lay judges do not see the prosecutor’s file. BGH, Decision of 27 February 1992 - 5 StR 190/91 (=BGHSt 38, 214, 225-26); BGH, Decision of 11 September 2007 - 1 StR 273/07 (=NJW 2007, 3587). § 69 sec. 3 declares that § 136a CCP is applicable as well to the interrogation of any witness. BGH, Decision of 13 May 1996 - GSSt 1/96 (=BGHSt 42, 139, 145). BGH, Decision of 9 June 2009 - 4 StR 170/09 (=NJW 2009, 3589). But see BGH, Judgement of 27 June 2013 – 3 StR 435/12 (=BGHSt 58, 301, 305-08): Suspect’s spontaneous utterance after he had unsuccessfully asked to speak to a lawyer triggered further judicial questioning; use of the suspect’s ensuing statement was held to violate the privilege against self-incrimination and the right to counsel. Most writers support an analogous application of § 136a CCP to egregious violations of human rights by private persons conducting an „interrogation“; see, e.g. Roxin/Schünemann, 2014 at 188; Schuhr in Münchener Kommentar, 2014 at § 136a notes 83–84. BGH, Decision of 13 May 1996 - GSSt 1/96 (= BGHSt 42, 139, 145-48). See BGH, Judgement of 26 July 2007 - 3 StR 104/07 (=BGHSt 52, 11, 18-21); Decision of 18 May 2010 - 5 StR 51/10 (=55, 138); Gless in Löwe/Rosenberg, 2007 at § 136a note 4; Meyer-Goßner/Schmitt, 2016 at § 110c note 3, § 136a note 3. See Gless in Löwe/Rosenberg, 2007 at § 136a note 22; Meyer-Goßner/Schmitt, 2016 at § 136a note 7. Psychological torture is covered by the prohibition of Quälerei (psychological torment). See BGH, Judgement of 3 May 1960 - 1 StR 131/60 (=BGHSt 14, 269, 271); Schulze-Fielitz in Dreier, 2013 at Art. 104 note 61. See the notification of 15 December 1953 (Bundesgesetzblatt 1954 II 14). Germany has also ratified the European Convention against Torture and Inhuman and Degrading Treatment of 1987 (Bundesgesetzblatt 1989 II 946). ECtHR, Ireland v. UK, case no. 5310/71, Judgement of 18 January 1978, § 162; Asalya v. Turkey, case no. 43875/09, Judgement of 15 April 2014, § 47. BGH, Judgement of 21 February 2001 - 3 StR 372/00 (=BGHSt 46, 292, 302-303). See ECtHR, Gäfgen v. Germany, case no. 22978/05, Judgement of 30 June 2008; Judgement (Grand Chamber) of 1 June 2010, §§ 165-166. For a comment, see Weigend, 2011 at 325. See also ECtHR, Harutyunyan v. Armenia, case no. 36549/03, Judgement of 28 June 2007, § 63; Cesnieks v. Latvia, case no. 9278/06, Judgement of 11 February 2014, § 65. See, e.g., LG Frankfurt am Main, Decision of 9 April 2003 – 5/22 Ks 3490 Js 230118/02, (2003) 23 Strafverteidiger, 325-27; Hamm, 2003; Wittreck, 2003; Hilgendorf, 2004; Saliger, 2004; Erb, 2005; but see also Brugger, 2000; Herzberg, 2005. Curiously, § 136 sec. 1 CCP refers to a written law (Gesetz) which, as such, does not exist. Germany did however ratify the International Covenant on Civil and Political Rights, which protects the privilege in Art. 14 (3) (g). BGH, Decision of 29 August 1974 - 4 StR 171/74 (=BGHSt 25, 365, 368); Judgement of 2 April 1987 - 4 StR 46/87 (=34, 324, 326); Judgement of 26 May 1992 - 5 StR 122/92 (=38, 302, 305). If the suspect makes a statement but declines to respond to further questions, this fact may be used with respect to the credibility of his statements; see BGH, Judgement of 3 December 1965 - 4 StR 573/65 (=BGHSt 20, 298); Meyer-Goßner/Schmitt, 2016 at § 261 note 17. BVerfG, Decision of 8 October 1974 - 2 BvR 747/73 (=BVerfGE 38, 105, 113); Decision of 13 January 1981 - 1 BvR 116/77 (=56, 37, 43); Judgement of 3 March 2004 - 1 BvR 2378/98 u. 1 BvR 1084/99 (=109, 279, 324). BVerfG, Decision of 13 January 1981 - 1 BvR 116/77 (=BVerfGE 56, 37, 43); for further references see Bosch, 1998; Schuhr in Münchener Kommentar, 2014 before § 133 notes 74–76. BGH, Judgement of 9 April 1986 - 3 StR 551/85 (=BGHSt 34, 39, 46); Judgement of 24 February 1994 - 4 StR 317/93 (=40, 66, 71-72); Judgement of 21 January 2004 - 1 StR 364/03 (=BGHSt 49, 56); Roxin, 1995 at 466; Rogall in Systematischer Kommentar, 2016 before §133 notes 73, 146–50. For a critical assessment, see Verrel, 2001. BGH, Judgement of 26 July 2007 - 3 StR 104/07 (=BGHSt 52, 11, 17-18); Rogall in Systematischer Kommentar, 2016 before §133 notes 79–81. BGH, Decision of 13 May 1996 - GSSt 1/96 (=BGHSt 42, 139, 153); Decision of 31 March 2011 - 3 StR 400/10 (=NStZ 2011, 596). But see, contra, Wolfslast, 1987 at 104; Ransiek, 1990 at 54-58; Roxin, 1997. In BGH, Judgement of 26 July 2007 - 3 StR 104/07 (=BGHSt 52, 11, 18), the Federal Court of Justice in 2007 explicitly left open whether it will continue its restrictive interpretation of the privilege against self-incrimination. BGH, Decision of 27 February 1992 - 5 StR 190/91 (=BGHSt 38, 214, 224). See also Judgement of 12 October 1993 - 1 StR 475/93 (=BGHSt 39, 349) (if suspect, due to mental incapacity, was unable to understand the information, his statement may be used only with his consent). BGH, Decision of 13 May 1996 - GSSt 1/96 (=BGHSt 42, 139, 145). See the criticism of Roxin, 1995 at 466. Or the defendant himself, if he has no lawyer and had been specifically informed by the judge that he must object to the use of the evidence. BGH, Decision of 27 February 1992 - 5 StR 190/91 (= BGHSt 38, 214, 226); Judgement of 12 January 1996 - 5 StR 756/94 (=BGHSt 42, 15, 22); see also BVerfG, Decision of 7 December 2011 - 2 BvR 2500/09 (=NJW 2012, 907, 911) (holding this decision constitutional). For criticism, see Fezer, 1997 at 58; Heinrich, 2000, 398. See the compromise judgement of Landgericht Frankfurt in the criminal case against the police officer who had uttered the threat of torture (convicting the defendant of coercion but imposing an extremely lenient sentence), LG Frankfurt am Main, Decision of 9 April 2003 – 5/22 Ks 3490 Js 230118/02, (2003) 23 Strafverteidiger, 325-27. See the comments under <http://www.focus.de/panorama/welt/verurteilter-kindsmoerder-neues-verfahren-wegen-entschaedigung-fuer-gaefgen_aid_808457.html>, accessed 1 November 2018. § 140 CCP describes the situations when a lawyer has to be provided for a suspect or defendant. One such situation exists when the suspect has been taken into pretrial custody (§ 140 sec. 1 no. 4 CCP). Pretrial custody however requires a judicial order and is to be distinguished from mere provisional arrest, which does not trigger the right to have a lawyer appointed. Resolution of the UN General Assembly on the Optional Protocol to the Convention against Torture and Other Cruel, Inhuman or Degrading Treatment or Punishment, UN Doc A/RES/57/199 of 9 January 2003. See <http://www.institut-fuer-menschenrechte.de/fileadmin/user_upload/PDF-Dateien/Europarat_Dokumente/Bericht_Menschenrechtskommissar_Deutschland_2015_Kommentar_Bundesregierung_de.pdf> accessed 1 November 2018. For an overview and discussion see Julius in Heidelberger Kommentar, 2012 at § 206a notes 8–15. The Federal Constitutional Court has held this interest to be part of the principle of Rechtsstaatlichkeit (a state based on the rule of law); see BVerfG, Decision of 15 January 2009 - 2 BvR 2044/07 (=BVerfGE 122, 248, 273); Judgement of 19 March 2013 – 2 BvR 2628/10, 2 BvR 2883/10, 2 BvR 2155/11 (=133, 168, 200-201); BVerfG, Decision of 18 December 2014 – 2 BvR 209, 240, 262/14 (=StV 2015, 413, 415). See BGH, Judgement of 18 November 1999 - 1 StR 221/99 (=BGHSt 45, 321, 333-34); Judgement of 11 December 2013 - 5 StR 240/13 (=NStZ 2014, 277, 280). It is a matter of controversy whether the inadmissibility of coerced statements also applies to evidence that favors the defense; see Gless in Löwe/Rosenberg, 2007 at § 136a note 71; Roxin, 2009 at 113; Wohlers, 2012 at 391; Diemer in Karlsruher Kommentar, 2013 at § 136a note 37; Roxin/Schünemann, 2014 at 173. This rule does, of course, not preclude the declarant from making the same statement again in court. Such a statement is admissible if the declarant had been informed that his prior statement is inadmissible. BGH, Judgement of 24 March 1959 - 5 StR 27/59 (=BGHSt 13, 60, 61). BGH, Judgement of 4 March 1958 - 5 StR 7/58 (=BGHSt 11, 211). See further Meyer-Goßner/Schmitt, 2016 at § 136a note 29; Schuhr in Münchener Kommentar, 2014 at § 136a note 96. BGH, Judgement of 28 June 1961 - 2 StR 154/61 (=BGHSt 16, 164, 166-67); Judgement of 21 July 1994 - 1 StR 83/94 (=NJW 1994, 2904, 2905); but see contra Gless in Löwe/Rosenberg, 2007 at § 136a note 77; Eisenberg, 2015 at note 707. BGH, Judgement of 28 June 1961 - 2 StR 154/61 (=BGHSt 16, 164, 167); Decision of 7 June 1983 - 5 StR 409/81 (=BGHSt 31, 395); Rogall in Systematischer Kommentar, 2016 at § 136a note 101. See, e.g., Gless in Löwe/Rosenberg, 2007 at § 136a note 78; Kühne, 2010 at note 966; Volk, 2010 at 178–79; Roxin/Schünemann, 2014 at 394; Eisenberg, 2015 at notes 708–709. BGH, Judgement of 14 June 1960 - 1 StR 683/59 (=BGHSt 14, 358); Judgement of 21 February 1964 - 4 StR 519/63 (=19, 325, 329-30); Krack, 2002 at 124. See BVerfG, Decision of 14 December 2004 - 2 BvR 1249/04 (=NJW 2005, 656); Merten, 2003 at 406; Meyer-Goßner/Schmitt, 2016 at § 136a note 1. See Neuhaus, 1997 at 314–315; Rogall in Systematischer Kommentar, 2016 at § 136a note 4; Eisenberg, 2015 at note 330. See Beulke, 1990 at 180; Amelung, 1999 at 181; Eisenberg, 2015 at note 368; Paul, 2013 at 494; Roxin/Schünemann, 2014 at 172–173 (arguing that the function of „disciplining“ police is misplaced in an inquisitorial procedual system); Ransiek, 2015 at 950–51. BGH, Judgement of 18 April 2007 - 5 StR 546/06 (=BGHSt 51, 285, 296). ECtHR, Harutyunyan v. Armenia, case no. 36549/03, Judgement of 28 June 2007, § 63; Gäfgen v. Germany, case no. 22978/05, Judgement (Grand Chamber) of 1 June 2010, §§ 165-166; Cesnieks v. Latvia, case no. 9278/06, Judgement of 11 February 2014, § 65. ECtHR, Jalloh v. Germany, case no. 54810/00, Judgement of 11 July 2006, § 107; Gäfgen v. Germany, case no. 22978/05; Judgement (Grand Chamber) of 1 June 2010, § 178; El Haski v. Belgium, case no. 649/08, Judgement of 25 September 2012, § 85. For a detailed analysis, see Rogall in Systematischer Kommentar, 2016 at § 136a notes 108-126. See BGH, Judgement of 28 April 1987 - 5 StR 666/86 (=BGHSt 34, 362, 364). BGH, Judgement of 22 February 1978 - 2 StR 334/77 (=BGHSt 27, 355, 358); Judgement of 24 August 1983 - 3 StR 136/83 (=32, 68, 70-71). See, e.g., Neuhaus, 1990 at 1221; Müssig, 1999 at 136–37; Hüls, 2009 at 167–68; Kühne, 2010 at 558; Eisenberg, 2015 at note 408. Ransiek, 2015, at 957–958. See, however, above as to the distinction between use (Verwertung) and employment (Verwendung) of evidence in German law and doctrine. BGH, Judgement of 22 February 1978 - 2 StR 334/77 (=BGHSt 27, 355, 358); Judgement of 18 April 1980 - 2 StR 731/79 (=29, 244, 249) (concerning illicit wiretapping); Judgement of 24 August 1983 - 3 StR 136/83 (=32, 68, 71); Judgement of 28 April 1987 - 5 StR 666/86 (=34, 362, 364); Decision of 7 March 2006 - 1 StR 316/05 (=51, 1, 8). Accord, Gless in Löwe/Rosenberg, 2007 at § 136a notes 75–76; Rogall in Systematischer Kommentar, 2016 at § 136a notes 1112–13. ECtHR, Gäfgen v. Germany, case no. 22978/05, Judgement (Grand Chamber) of 1 June 2010, § 178. If the information was not given, any statement of the suspect is inadmissible as evidence; BGH, Judgement of 22 November 2001 - 1 StR 220/01 (=BGHSt 47, 172). BGH, Decision of 27 February 1992 - 5 StR 190/91 (=BGHSt 38, 214) (concerning defendant); Oberlandesgericht Celle of 7 February 2001 - 32 Ss 101/00 (=NStZ 2002, 386). According to a controversial decision of the Federal Court of Justice, the self-incriminating statement of an unwarned witness can be used as evidence against the defendant (but not against the witness); BGH, Decision of 21 January 1958 - GSSt 4/57 (=BGHSt 11, 213). BGH, Decision of 27 February 1992 - 5 StR 190/91 (=BGHSt 38, 214). BGH, Decision of 27 February 1992 - 5 StR 190/91 (=BGHSt 38, 214, 220-22). BGH, Decision of 27 February 1992 - 5 StR 190/91 (=BGHSt 38, 214, 224-25); Judgement of 12 January 1996 - 5 StR 756/94 (=BGHSt 42, 15, 22). The Court explained that knowledge of the right to remain silent can be assumed when the suspect makes a statement in the presence of counsel, but that knowledge cannot be inferred from the fact that the suspect had previously been prosecuted or convicted. Gless in Löwe/Rosenberg, 2007 at § 136 note 81. BGH, Judgement of 18 December 2008 - 4 StR 455/08 (=BGHSt 53, 112) (overruling Judgement of 31 May 1990 - 4 StR 112/90 (=BGHSt 37, 48, 53)). See, e.g., Gleß/Wennekers, 2009 at 383; Jahn, 2009 at 468; Beulke, 2016 at note 119. BGH, Judgement of 3 July 2007 - 1 StR 3/07 (=StV 2007, 450, 452); Judgement of 18 December 2008 - 4 StR 455/08 (=BGHSt 53, 112, 114). BGH, Judgement of 28 April 1987 - 5 StR 666/86 (=BGHSt 34, 362, 369). See, e.g., BGH, Judgement of 18 November 1999 - 1 StR 221/99 (=BGHSt 45, 321, 339) (for a case of entrapment). BGH, Decision of 27 February 1992 - 5 StR 190/91 (=BGHSt 38, 214); Judgement of 22 November 2001 - 1 StR 220/01 (=BGHSt 47, 172). Witnesses also have a right to have a lawyer present during their interrogation (§ 68b CCP). See the 2017 amendments to the Code of Criminal Procedure enacted through the Law for the more efficient and practical organisation of the criminal process (Gesetz zur effektiveren und praxistauglicheren Ausgestaltung des Strafverfahrens) of 17 August 2017, Bundesgesetzblatt 2017 I, 3202.